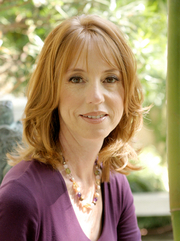 Lisa See is the author of Snow Flower and the Secret Fan, Peony in Love: A Novel, On Gold Mountain, and more. Her newest novel is Shanghai Girls. Tell me about your personal library. Do you have a favorite book? I have a lot of books that I inherited from my grandmother. I have books that belonged to my mother and father when they were children. And of course, I also have the books I’ve bought over the years. I would say that my library combines books on China, lots of first novels, mysteries, and plenty of art books. A favorite book? That’s like asking which is my favorite child. It depends on the day! I think the book that has had the biggest influence on me as a writer is Angle of Repose by Wallace Stegner. I even used a line from that book as the epigraph for On Gold Mountain: “Fooling around in the papers my grandparents, especially my grandmother, left behind, I get glimpses of lives close to mine, related to mine in ways I recognize but don’t completely comprehend. I’d like to live in their clothes a while.” I’m still trying to do that: linger in old papers and live in other people’s clothes for a while. Right now I’m reading Dreams from My Father by Barack Obama. (I think I’m the last person in America to get around to it.) I’m also reading A Single Tear by Ningkun Wu and Yikai Li. It’s a memoire written by a married couple who returned to China in 1951 and suffered greatly. And Southland by Nina Revoyr. I read different things for different purposes during the day. I found Shanghai Girls heart-wrenching and beautiful. What inspired you to write it? Four things, really. First, I’ve been collecting Shanghai advertising images from the Twenties, Thirties, and Forties for many years. The so-called Beautiful Girls, women who posed for commercial artists, were right in the heart of the excitement in Shanghai. The charming and captivating life illustrated in advertisements is one thing, but I was interested in seeing what real life was like for those women. I also wanted to write about what it was like for Chinese women who came to America in arranged marriages. (We had a lot of arranged marriages in my family. I know how hard life was for the women.) Third, I wanted to write about China City, a short-lived tourist attraction in Los Angeles. And finally, I wanted to write about sisters. The sibling relationship is the longest that we’ll have in our lifetimes. A sister knows you your entire life. She should stand by you, support you, and love you, no matter what, but it’s also your sister who knows exactly where to drive the knife to hurt you the most. The complex relationship between sisters Pearl and May is central to the book. Do you have a sister? I have a former step-sister that I’ve known for fifty years. I have a half-sister who is my mother’s daughter. I also have another half-sister who is my father’s daughter. We all get along great, although like sisters everywhere we have our moments. My sister Clara always reads my manuscripts. There were a couple places where she wrote in the margin things like “Way to get back at Katharine” or “It didn’t happen that way.” As I was writing Shanghai Girls, I didn’t think of it as being autobiographical in any way, but I guess some of my experiences snuck in after all! Do you ever think about how the story would be different if told by a different character? What would May have to say? I think about that all the time. When I was writing Snow Flower and the Secret Fan, I always thought about how Snow Flower would have told the story differently from her position in the afterworld. (In fact, that’s how I came to write Peony in Love in the voice of someone in the afterworld.) Often, when I was working on Shanghai Girls, I thought about May – what she was thinking and feeling. There are some hints of how she feels along the way: when she gets frustrated with Pearl for not “crossing the street” on the night that China City opens, when she takes long walks so she won’t be in the apartment with the baby, and way she’s always trying to improve her life. Then, at the end, she finally has a chance to tell the story from her point of view. It seems like your heritage has shaped your writing quite a bit. Did you start your career as a writer knowing this would be the case? What an interesting question. I started out as a journalist, writing profiles and doing pieces on subjects like how they make food look good in commercials, so in that respect the answer would have to be no. But I also collaborated on three books with my mom and our friend, John Espey. We wrote under the pseudonym of Monica Highland. Our first novel was Lotus Land, a kind of historical romp through the early days of Los Angeles. One of the three main characters was very loosely based on my great-grandfather. Our next novel was 110 Shanghai Road. Guess where that took place! So I guess the answer is that I didn’t “know” that my heritage would shape my writing. It just did all by itself. Did you have to do a lot of research to make the historical details so accurate? I feel like I learned a lot--about paper sons, and Angel Island, for example. I love research. I’d go so far as to say I’m a research fanatic. I also over research. In many ways it’s my favorite part of writing a book. Some writers hire people to do research. I could never do that, because I never know what I’m going to find that will completely change the course of a book. I live close to UCLA and I love to spend time in the Research Library stacks. But the real excitement comes from going places—I go to every place I write about—and from talking to people. Then, when I come across something amazing, I think to myself, “Oh, I’ve got to use this!” I felt that way when I first read about ghost marriages. I felt that way when I first learned that unmarried women in China were left outside to die. A single small fact can trigger my imagination, so that I can write a whole chapter or even a novel from it. What’s important though is that the facts not detract from the characters and the emotions of the novel. I want readers to feel like they’ve learned a lot, but I want them to connect to the characters much, much more. I heard you were writing a sequel to Shanghai Girls--true? Yes! I’m very excited about it, but I can’t say too much without giving away the ending of Shanghai Girls to those who haven’t read it yet. Let’s just say that the voices of Pearl, May, and Joy will be very strong.